As a premier family dentistry practice with offices in Warrensburg, Oak Grove, and Windsor, MO, one question that we hear frequently is “when should my child see the dentist?.” This is an excellent question and one that is relevant because there is a fair amount of confusion surrounding it. 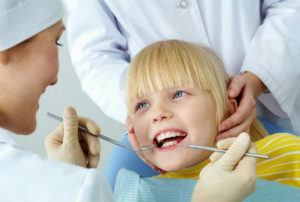 Some say that a child doesn’t need to see the dentist until age 2 or 3. Others say that dental exams can begin when the first tooth erupts, or as soon as two adjacent teeth sit side by side. We suppose they may all be correct, depending on the skill level and preferences of the dentist you choose. At Ridgeview Family Dental, we see children of all ages. We do more than quickly examine however many teeth are in the mouth; we make every effort to build trust in our young patients so dentistry does not become something they fear. The primary benefit that parents obtain from scheduling checkups and cleanings while their children are very young is cavity prevention. A lot of the work we do with young children is education. We discuss important care habits with parents, such as not putting their child to bed with a bottle of milk or juice. Parents want to do all that they can to prevent their children from experiencing pain, and routine dental care can do this. In addition to demonstrating how to brush growing teeth, and even how to clean the gums and tongue of an infant, we also perform preventive services that can further inhibit the development of tooth decay. Research demonstrates that early childhood dental care also leads to lasting benefits. Children who regularly see the dentist throughout their early years are children who usually grow up to take very good care of their teeth and gums. Because they have likely had positive experiences in dental care, they are interested in continuing routine exams and cleanings throughout adulthood. The early care and prevention a child receives can make a different for their lifetime. To schedule your consultation and exam with our friendly team, contact the Ridgeview Family Dental office nearest you.